Hello there lovely readers! Can you believe it is almost New Years??? 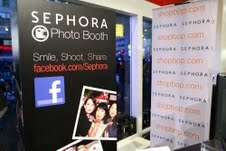 Just had to share with you some great photos from the latest NYC Sephora/Shopbop Launch Party! Sephora & Shopbop debuted the Sephora Collection Palette Color Play 5 in 1 limited-edition palette with a NYC launch party. No, I was not lucky enough to attend, but was emailed the photos to share with ya'll on my blog! You NYC girls have it so lucky being able to attend these fun events!!! The party-goers had to trek over ice and snow this past Tuesday night to attend the launch party. 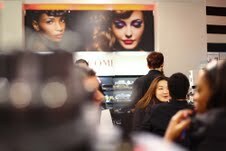 But once they were there, they were pampered with complimentary makeovers and beauty tips from Sephora Makeup Artists. Looks like a fun event! Champagne, Make-overs, and beauty-tips...sounds like my kind of party! 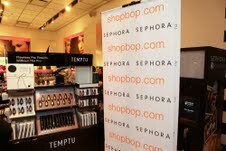 Seriously, Sephora and Shopbop....ya'll should bring the next party to Atlanta!!! The Sephora Collection Palette Color Play 5 in 1 limited-edition palette is a collaboration between Shopbop and Sephora. The palette was inspired by Shopbop's "Faces of Fashion" look book which launched yesterday on shopbop.com. 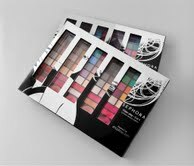 I can't wait to see the Sephora Collection Palette Color Play 5 in 1 limited-edition palette in person! It is a large palette with 5 sub-palettes inside that can be removed and inserted into a compact (how cool!). 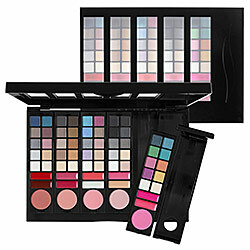 Each subpalette contains a complete "look" with eye, lip, and cheek color. I don't know about ya'll, but I LOVE my big palettes...but, that's just it. They are too big for travel. The idea that you can snap out your "look" and take it with you is pretty darn genius! Can't wait to try this! I love this idea! Can't wait to see these. This is a really cool idea! I'd have to read some reviews -- I was never impressed with Sephora brand eyeshadows but I've heard they've gotten better.